The ReStore is a home improvement outlet open to the public. Shop for quality donated home furnishings, furniture, and building supplies at a fraction of the original cost. 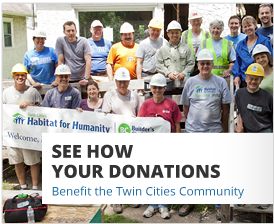 All revenue supports Twin Cities Habitat for Humanity’s work building, rehabbing and repairing homes for hard-working local families. 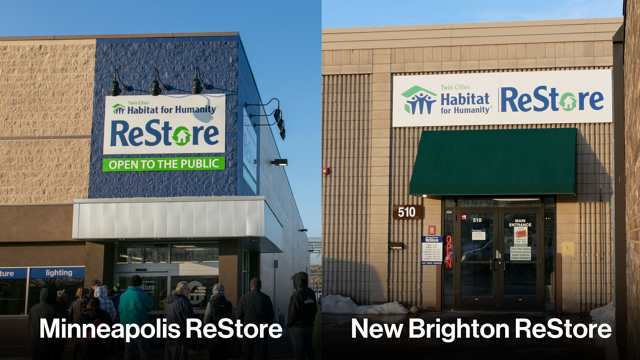 This year, proceeds from the ReStore will sponsor the construction of six homes for low-income Twin Cities families. Families are the foundation of what makes us thrive. There is no better testament to the importance of our work than the stories of the families whose lives have been changed by owning an affordable home. We invite you to meet a couple of our partner families. The stability of an affordable mortgage has allowed Teri to do things she never imagined before Habitat. She saved to buy a new car and to take two family vacations. She’s even been promoted a couple times at her job as an administrative assistant. Safety and money were huge worries for the family before buying their Habitat home. Now they’re optimistic about a future that includes things like high school sports and higher education. Kenisha Petties’ daughter Khalilah was born with an extremely rare form of spina bifida. Walking is very challenging for her. The family was renting a townhome filled with stairs that posed a constant danger to Khalilah. In November 2012, after two years of hard work and smart budgeting, the family closed on a home in Fridley that was specially designed to meet Khalilah’s unique needs. Kenisha remembers being thrilled when she got the call that her family had been selected to buy a Habitat home. She works for HealthPartners. She has stressed the importance of a good education to her four children. Her oldest son, Ronnell, started college this year. Khalilah is focusing on math so she can be a forensic scientist when she gets older. "I've learned a lot about working as part of a team and organizing things," said Kuvvet. "A lot of these little tasks will help me when I become a homeowner." "Putting in the majority of my sweat equity hours at the ReStore has been a great opportunity," said Tenisha. "The staff is so inviting and there's great variety in the work you do."